I'm a 39 year-old professional comic book penciller and inker from Brazil. 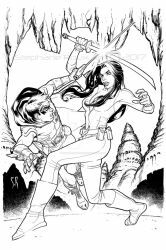 I've worked on several titles for Dynamite Entertainment as their exclusive artist, such as Robert Jordan's Wheel of Time, Dejah Thoris, Anne Elizabeth's Pulse of Power, Army of Darkness and more. I'll try and keep this profile updated, as long as the deadlines stay off my way! Nice to be around here! Drop me a line if you want to! P.S. : You can also follow me on twitter ( twitter.com/marciofiorito ) or add me on Facebook. 70% of the time, it´s in portuguese, but I´ll drop some tweets and posts in english from time to time. But I'll try and post some skecthes, warm ups and comissions I've been tampering with. Hope you guys enjoy the ride! Playing: Shadowrun Returns, when possible. Eating: More than I should. Less than I want. I love your Avengers and Justice League line-ups! Do you have plans for the X-Men or the Teen Titans? I had those laid out, but can´t do those right now. A lot of work. Which is a good thing! Fair enough. I look forward to them at some point in the eventual future.